In celebration of the 400th anniversary of the King James Bible, these long-awaited volumes bring together succinct introductions to each biblical book, detailed explanatory annotations, and a wealth of contextual and critical materials. Archaic words are explained, textual problems are lucidly discussed, and stylistic features of the original texts are highlighted. Judicious and economical, the introductions and annotations to the Old Testament give readers without Hebrew an entry into complexities of biblical literature, reconstructing its original contexts, tracing its evolution, and pointing out productive strategies of reading. Incorporating the insights of modern biblical scholarship as well as centuries of precritical interpretation, they offer essential guidance to a labyrinthine world, while respecting the text’s integrity. The historical and critical appendix comprises three distinct collections. A section on ancient Near Eastern backgrounds presents the myths, hymns, prayers, and legal codes that informed the creation of the Hebrew Bible. A historical anthology of biblical interpretation gathers—for the first time in one volume—generous selections from the Jewish, Christian, and Muslim traditions, along with classics of secular commentary. It includes reflections on the Bible by philosophers from Hobbes to Ricoeur; a compendium of modern biblical scholarship, focusing on topics such as the oral and the written, the composition of the Pentateuch, and the historical movement from covenant to canon; and a provocative sampling of comparative and literary approaches. The crucial presence of the Old Testament within English literature is represented by paraphrases and parables in verse and prose, and a recapitulatory conclusion brings the diverse perspectives of this millennial survey to bear on two of the Bible’s most famous passages: the expulsion from the garden of Eden and the binding of Isaac. 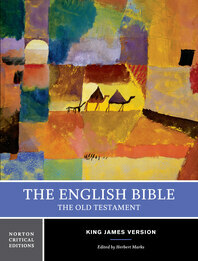 A final section devoted to the question of translation includes significant English versions from Wycliffe to the present. Time lines, chronologies, diagrams, and maps are included.